The megalithic St Lythans burial chamber, in Welsh siambr gladdu Lythian Sant, part of a long Neolithic chambered long barrow built about 6000 years ago. St Lythans burial chamber is a Neolithic dolmen and was one of several chambers that was part of a large burial mound 27 metres (89 ft) long, 11 metres (36 ft) wide. Little is known about the ritual of burials in these Neolithic stone chambers but archaeologists have excavated many dolmen. Their excavations have shown that the stone chambers contained the bones of many different individuals. and often the bones were laid out with skulls together and larger bones in neat piles. The lack of small bones suggest that the bodes were left to decay or be eaten away from the burial chamber and then the bones were moved into the dolmen. 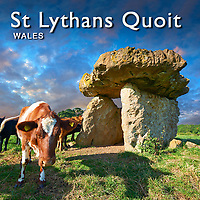 Dolmen like St Lythans burial chamber were used for a time then sealed and another chamber built. In this way such Neolithic long barrows grew. The prices nature of the rituals held at these burial sites can never be precisely known but the effort which went into building them indicates that they were very important to the Neolithic communities that built the.